Soft, touchable, voluminous hair. Think you can't have it all in one go? Think again. Introducing TRESemmé Beauty-Full Volume Collection! This revolutionary haircare system rewritten the rules of voluminous hair by reversing the traditional wash and care routine (i.e. conditioner before shampoo). Several months ago, I've read about the benefits and getting "perfect hair" by using conditioner before shampoo. I applied the method and the results were amazing. My hair overall felt and looked nourished. The TRESemmé Beauty-Full Volume Collection does just that and better with their Fleximax™ Volumizer formula - this will keep your mane full of volume. The pre-conditioner preps the hair for voluminous bounce before even shampooing. It also reinforces hair's natural protective layer during washing and leaves it smooth and polished. The conditioner texture was not too thick and the scent was very pleasant and fresh. The only problem with starting with a conditioner is that it can be a bit challenging at first. Conditioner is usually used for the ends of the hair, in this case, it needs to be worked throughout the hair. Also, conditioner doesn't foam, so it's hard to know how much product is in the hair. However, a few pumps as suggested should be enough. After leaving the conditioner for about a minute, rinsing off the conditioner was efficient. The shampoo works gently to cleanse and remove excess weight. In addition, it helps control static and flyaways, infusing hair with volume and leaving it perfectly prepped for styling. There was something about this shampoo that I absolutely love and that is the scent! It's not fruity but it had a scent of a particular fruit (if you try this product and know what I'm talking about, leave a comment below!). The texture of the shampoo was a bit on the liquid side. It lathered very nicely but very foamy. Do note, a little really does goes a long way - it's super foamy. This lightweight cream with Fiber Polishing Actives smoothes the cuticle, leaving hair silky and polished. The Maximizer has a light cream consistency and doesn't weigh down the hair at all. After using the conditioner and shampoo and slightly towel drying the hair until it was damp but not dripping puddles everywhere, I applied the Hair Maximizer. Starting from the root to the tip, focusing on the length and then blow drying, I noticed my hair was much more volumized but at the same time was silky and smooth. Normally when I blow dry my hair, volume is always there but the shine doesn't show. Overall, a great collection to get soft, silky, polished, volumized hair. The reverse system may be a challenge at first but after a few rounds, you'll never go back to the shampoo then conditioner routine. 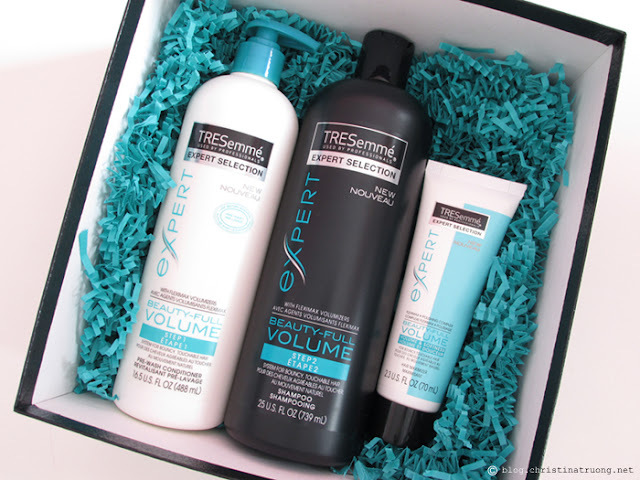 What are your thoughts on TRESemmé Reverse Wash System? Thanks for this review! I've just heard about Reverse washing and have been trying it with the shampoo and conditioner I already have. I've had very good results my first two days with this method. I will plan on trying out this Tresemme product when I finish up with the ones I already have. Great review! I just tried this line out last week. I agree with you that it's hard to determine how much conditioner you need, since it doesn't foam up. I really enjoyed the shampoo, it reminded me of green apple!